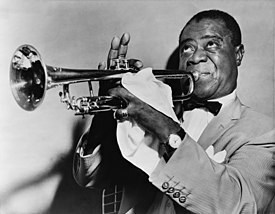 ^ Jazz Origins in New Orleans - New Orleans Jazz National Historical Park (U.S. National Park Service). www.nps.gov. [2017-03-19] （英语）. ^ A Map of Jazz Styles by Joachim Berendt, "The Jazz Book". www.sbg.ac.at. [2017-03-19]. ^ Hennessey, Thomas, From Jazz to Swing: Black Jazz Musicians and Their Music, 1917-1935. Ph.D. dissertation, Northwestern University, 1973, pp. 470-473. ^ Starr, Larry, and Christopher Waterman. "Popular Jazz and Swing: America's Original Art Form." IIP Digital. Oxford University Press, 26 July 2008. ^ 6.0 6.1 Wilton, Dave. The baseball origin of 'jazz'. OxfordDictionaries.com (Oxford University Press). 2015-04-06 [2016-06-20]. ^ Seagrove, Gordon. Blues is Jazz and Jazz Is Blues (PDF). Chicago Tribune. 1915-07-11 [2011-11-04]. （原始内容 (PDF)存档于2012-01-30）. Archived at Observatoire Musical Français, Paris-Sorbonne University. ^ Benjamin Zimmer. "Jazz": A Tale of Three Cities. Word Routes. The Visual Thesaurus. 2009-06-08 [2009-06-08]. ^ 10.0 10.1 Joachim E. Berendt. The Jazz Book: From Ragtime to Fusion and Beyond. Translated by H. and B. Bredigkeit with Dan Morgenstern. 1981. Lawrence Hill Books, p. 371. ^ Christgau, Robert. Christgau's Consumer Guide. The Village Voice (New York). 1986-10-28 [2015-09-10]. ^ Cooke, Mervyn; Horn, David G. The Cambridge companion to jazz. New York: Cambridge University Press. 2002: 1, 6. ISBN 0-521-66388-1. ^ Luebbers, Johannes. It's All Music. Resonate (Australian Music Centre). 2008-09-08.